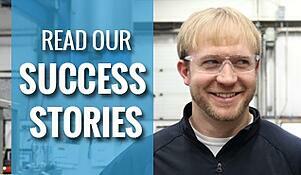 I'm Tom Piette, I work on the energy reduction program at Thilmany Papers in Kaukauna, Wisconsin. I spent the last several years working on several different projects to decrease our energy usage. We've decreased our energy usage per tonne by about 25 percent during that time. I've been working with Crane Engineering now for the last five years with some of the pump projects that we've looked at. One of the things that we've tried to do is improve the efficiency of our pumping system. A few years ago we had some studies completed to help us with that. We used the ITT pump survey and we identified about 20-25 pumps in that plant that we wanted to have a closer look at. We wanted to find out how we were doing in respect to energy efficiency of those pumps. Out of that we discovered a basket of projects that we could work on, in many cases having paybacks of about two years or three years, sometimes even less. We've been implementing those projects since that time. We went into the project for improving pump efficiency with the goal of saving money and energy, but one of the things that we found is that as we looked at our systems, there was more to it than that. A lot of the fuel pump bodies were poor, we found that we needed to improve our maintenance procedures and our practices in that regard. We also found that the life for the pumps could be extended greatly by operating at the best efficiency point. So we've been trying to implement those kinds of things since that time. Of course part of that is using variable frequency drives to help us with reducing the energy required as we've used these pumps. The biggest help that we got from Crane was, in the process of surveying they measured a lot of things. They measured a lot fo pump flows, a lot of pressure from our pumps, took a quick look and from that camp up with an estimate of the cost to improve the system and get the pumps operating at the best efficiency point. They offered options such as replace the pump with a different pump, or use a drive, shave an impeller, so there was a range of solutions from a maintenance fix, to use of capital from the mill to improve that operation. As a consequence of all that, we've had some good results. Some of results that we're finding, for example, we have one pump that we've looked at for paper stock that we're going to be able to change the way it operates. It presently operates with the valve open about 20%. We will put that on a drive and of course we'll end up saving many thousands of dollars per year. The environmental pay off, of course anytime we decrease the usage of electricity in the plant, all the incremental electricity in the plant is purchased, so that is going to come off the grid, and there would be less emission nof carbon dioxide and other pollutants as a result of lower energy usage. The Crane engineers that we've worked with have all been professional, are good to work with, have good ideas to help us, and they're there when we need them. Need to save more energy, but not sure how?